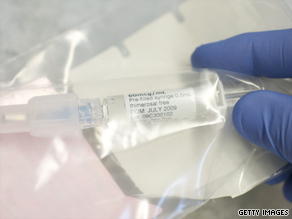 (CNN) -- Next week, the long-awaited H1N1 vaccine is expected to arrive. At least three of the four vaccine makers have begun shipping their products to undisclosed distribution centers. Clinical trials to test the effectiveness and safety of the H1N1 vaccine have been under way since the summer. There are two types of the vaccine available: the flu shot, an inactivated vaccine containing fragments of killed influenza virus, and a nasal spray, which is made using a weakened live flu virus. The nasal spray will most likely be the first to be widely distributed, however certain groups, including pregnant women, young children and people with compromised immune systems, cannot receive the nasal spray. So far officials of the National Institutes of Health say that in clinical trials they've seen no serious side effects and that study subjects who have been immunized have generated a good response. The Centers for Disease Control and Prevention recommends the vaccine for certain high-priority groups because they are more likely to have serious complications if they develop swine flu. These groups include: pregnant women; caregivers and household contacts of children younger than 6 months; everyone between the ages of 6 months and 24 years; and people ages 25 to 64 with existing health problems. Even people who are not in these groups can get the vaccine. But now the vaccine is almost here, the question is, "Do you want it?" We looked through our Empowered Patient inbox and it turns out that many of our readers still have questions. We consulted a team of experts to get their answers, which are edited for brevity and clarity. • When can I expect the H1N1 vaccine to be available where I live? • Where can I find the vaccine when it comes out? Check with your doctor, your children's school and your local public health department. Right now there's no central list of locations where swine flu vaccine will be offered, but the Department of Health and Human Services plans on putting information on Flu.gov as soon as possible. • Will I be required to take the vaccination? It's not a crime to say no to the H1N1 flu vaccine. You won't go to jail, nor will you be fined by the federal government if you decide not to get it. If you're in the military, however, you will be required to get the vaccine, according to the American Forces Press Service. In New York, the state government is requiring the vaccine for health care workers, but there are no penalties built into the law if a worker doesn't comply. Some workers fear they'll lose their jobs if they don't get the vaccine. • My child is 7 and I am 28 and healthy. I know he should receive the H1N1 vaccine since he's at high risk for complications from the flu, but do I need one as well? Technically, you, as a parent, don't "need" an H1N1 vaccine because you don't fall into one of the five high-risk groups designated by the CDC. However, the team of experts we consulted were unanimous that if there's enough vaccine available, go ahead and get one if you want -- they say it won't hurt you, it will protect you from the flu, and it could help protect your child as well because you won't be bringing the virus home to your child. "If there's plenty of vaccine, it just makes sense to get it," said Dr. Aaron Glatt, a spokesperson for the Infectious Diseases Society of America, and president and CEO at New Island Hospital in Bethpage, New York. • Will the shots contain thimerosal? Some H1N1 shots will contain the preservative thimerosal, and others won't, according to the CDC. You'll have to ask your doctor (or the clinic administering the shots) which type you're getting. Some people worry about thimerosal for children because it's mercury-based, but the CDC says there's no scientific evidence the preservative is harmful. • I am 12 weeks pregnant and getting pressure from some family members to get the H1N1 vaccine. I am opposed to it mainly because it is so new. I would like to know what side effects they are projecting? So far, the NIH has vaccinated more than 60 pregnant women as part of a study to see whether the H1N1 vaccine is safe and effective. There have been no reports of serious side effects, according to Linda Lambert of the Division of Microbiology and Infectious Diseases at the National Institute of Allergy and Infectious Diseases. The NIH plans on vaccinating a total of 120 women in its study. Every pregnant woman needs to decide for herself whether she wants the H1N1 vaccine. The swine flu virus has been particularly dangerous for pregnant women; 6 percent of the people who've died from H1N1 since April have been pregnant women, while pregnant women make up only 1 percent of the U.S. population, according to Dr. Anne Schuchat, director of CDC's National Center for Immunization and Respiratory Diseases. Why are pregnant women more vulnerable to H1N1 flu? "It's partly because pregnant women have some degree of compromise of their immune system, and their ability to fight off even fairly common illnesses such as the flu appears to be much lower," said Dr. Neil Silverman, a professor of obstetrics and gynecology at the University of California-Los Angeles School of Medicine. In addition to protecting pregnant women, studies show vaccines give immunity to a newborn for at least a few months as antibodies cross the placenta and reach the fetus. This is especially important since babies cannot get an H1N1 vaccine themselves until they're 6 months old. By the way, pregnant women and children under age 2 can't get the nasal spray -- the shot is their only option. • My daughter is 29 and in good health and would like to start trying to get pregnant. We are thinking that she should have the H1N1 vaccination before she starts trying to become pregnant. Is this the best course of action? Should she wait until she actually becomes pregnant? Are there any implications in either of these cases for the health of the future fetus? Our team of experts is divided on this one. Some say since the CDC had designated only pregnant women as being at high risk, your daughter should wait until she's actually pregnant to get the shot. "It's hard to predict when she and her partner might actually have a successful pregnancy, and there's plenty of time to vaccinate when they do conceive," Silverman said. "The key here is targeting risk groups appropriately, and her risk wouldn't begin to increase until she was actually pregnant." Others, however, disagree. They say your daughter might as well get the shot now, since she'll never know exactly when she'll become pregnant, and she might as well be protected against H1N1 from the very start. "Your daughter can receive the H1N1 vaccine as soon as it becomes available," said Dr. William Schaffner, chairman of the Department of Preventive Medicine at Vanderbilt University School of Medicine. "There is no benefit in waiting until she is pregnant. The H1N1 vaccine [as well as the regular seasonal vaccine] is safe for both the mother and the future fetus." Perhaps Dr. Peter Palese, a professor of Medicine and Infectious Diseases at Mount Sinai School of Medicine in New York City, summed it up best. "Any which way is fine" is his advice for your daughter as far as whether she should get it while she's trying to become pregnant or after she conceives. • I see very little information available to the public about how the vaccines compare as the manufacturing process for each. Are they created using the exact same technique? If so, does that mean that the safety/risk profile is the same for each? A flu shot is a flu shot is a flu shot, according to the Food and Drug Administration, which licenses companies to make vaccines. "All flu vaccine manufacturers use essentially the same technique to produce the seasonal and H1N1 vaccines. They each produce a slightly different version of the vaccine, but all versions adhere to the FDA's stringent standards for safety and effectiveness," said Pat El-Hinnawy, a spokeswoman for the FDA. • I've heard 56 children have died since April from H1N1. Could you give me more detail about this figure? I would like to know of those 56 children, how many had underlying health care problems? How many of them sought medical attention? And finally, what is the age range or average age of the 56 children? According to the CDC, of these 56 children, 31 had a pre-existing medical condition such as spina bifida or cerebral palsy before they became infected with H1N1, 17 did not, and health authorities don't have data on the eight other children. Among the children for whom the CDC has information, 35 died in a hospital's intensive care unit, four died in the emergency room, three died on an inpatient ward in the hospital and five died outside the hospital, such as at home or on the way to the hospital. The average age of the children who died is 10 years old. A September 4 CDC report has more details on the pediatric deaths. • My children and I have all been sick over the last two weeks with flu-like symptoms. If we have already possibly had swine flu, do we really need to put our kids through the shots and pay for the doctor visits? A flu-like illness could be caused by a wide array of viruses, not just H1N1. Unless the doctor actually tested your children for H1N1 and the test came back positive, your child should get the H1N1 vaccine. Most people who've had flu-like illness since April have not been tested. CNN's Sabriya Rice and Sharisse Scineaux contributed to this report.